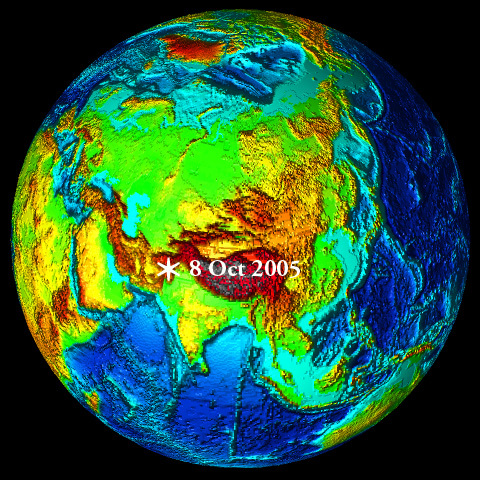 A massive earthquake struck Pakistan and parts of India and Afghanistan on Saturday morning October 8, 2005. This was the strongest earthquake in the area during the last hundred years. This earthquake was by far the most destructive disaster in the region. Current reports indicate that close to 80,000 people were killed and at least 50,000 more were injured in the northern areas of Pakistan, in the Pakistani-controlled Kashmir, in the Indian-controlled Kashmir (known as Jammu-Kashmir), and in Northern India. Thousands of houses were destroyed. Pakistani Kashmir's main city, Muzaffarabad, was severely affected with almost half of its homes destroyed. Indian Kashmir was also severely damaged with hundreds of dead and injured, mostly in the town of Uri. There were numerous deaths also in major Pakistani cities of Islamabad and Rawalpindi. A 10-story residential building (known as the Margalla Tower) collapsed completely in Islamabad killing most of the occupants. The death toll is expected to rise significantly as reports from remote areas filter in. The earthquake occurred on Saturday, October 8, 2005 at 03:50:38 (UTC). 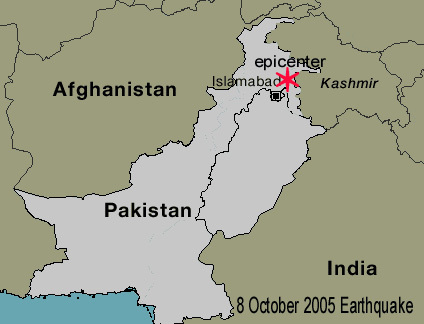 Its epicenter was at 34.402 degrees North, 73.560 degrees east, about 90 km north-northeast of Pakistan's capital, Islamabad. It was felt in major cities, including Islamabad and Lahore, and India's capital of New Delhi. The earthquake was relatively shallow and thus had greater intensity and destructiveness. According to the U.S. Geological Survey the focal depth was very shallow at about 10 km. The shallowness of the earthquake contributed significantly to destruction in the region. The moment magnitude was measured to be 7.6 (U.S. Geological Survey), 7.5 (Pakistani Meteorological Service) and 7.8 (Japan Meteorological Agency). A final estimate of the moment magnitude of the earthquake is 7.7. More than 20 aftershocks ranging from 4.5 to 6.3 in magnitude struck the area in 18 hours following the main shock. The aftershocks are expected to continue. for days, weeks and months. The high relief of unstable mountains makes Northern Pakistan very vulnerable to extensive landslides when an earthquake strikes the region. Heavy monsoon rains - particularly if they occur before or after an earthquake, can be the catalyst to further devastating landslides. The earthquake of 8 October 2005 was responsible for many landslides. Strong earthquake aftershocks may also trigger additional landslides of unstable mountain slopes and endanger villages in the region. As it can be seen from the two images below taken by the Advanced Spaceborne Thermal Emission and Reflection Radiometer (ASTER) before and after the earthquake, there were extensive landslides in and around the city of Muzaffarabad. The landslides blocked the roads, thus further isolating the stricken region. In the ASTER images below, vegetation is shown in red, water is shown in blue and the city of Muzaffarabad is shown in grey. The image taken on October 27, 2005 (almost three weeks after the earthquake) shows the land exposed by landslides to be white and tan in color. 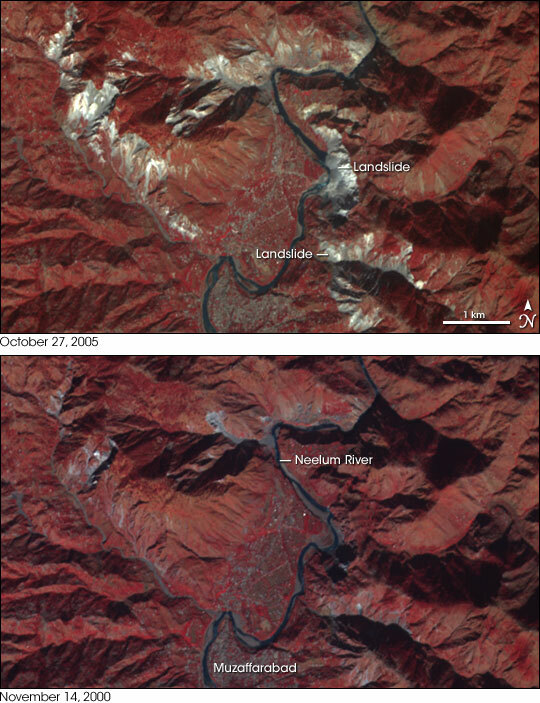 NASA images of landslides in Pakistancreated by Jesse Allen, Earth Observatory, using data obtained from the University of Maryland's Global Land Cover Facility. The earthquake occurred along a tectonic boundary which is characterized by high seismic activity. Major tectonic elements along this particular zone of deformation were formed during the Cenozoic and Mesozoic eras. The zone extends from the Makran region in southwest Pakistan, to the Hazara-Kashmir syntaxial bend in the north. This seismic boundary has been formed by the interaction of the Indian, Arabian and Eurasian Plates. The Indian tectonic plate is moving in a northward direction at a rate of about 40 mm/yr (1.6 inches/year). It collides and is forced beneath the Eurasian tectonic plate. This process has continued for millions of years. Major active fault systems traverse Northern India and Western and Northern Pakistan.Compression along these boundaries results in thrust or reverse type of faulting with the net result being an upward displacement of crustal material. This process of orogenesis has formed the Himalayan Mountain Range as well as the Pamir, Karakoram, and the Hindu Kush ranges and the Tibetan Plateau. In the northern part of Pakistan, the Hindu Kush mountains converge with the Karakoram Range, a part of the Himalayan mountain system. Northward movement of the Indian Tectonic Plate has resulted in major fault systems in Pakistan, Kashmir and Northern India. 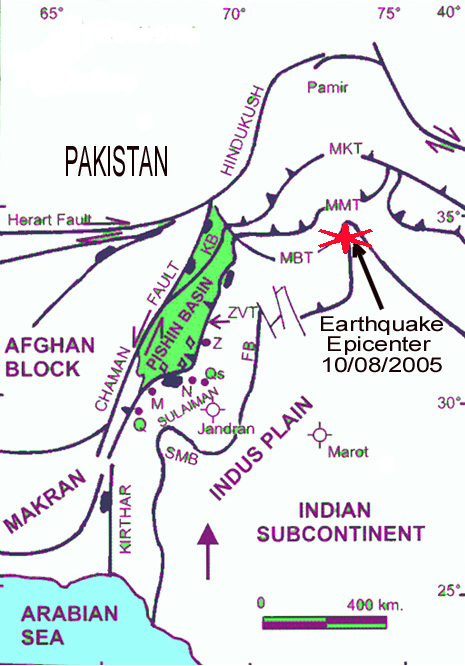 Epicenter of the 8 October 2005 earthquake (Modified base map after Jadoon and Khurshid, 1996). Seismicity of the region (USGS graphic). Northern, Western as well as Southern Pakistan, Kashmir and Northern India and Afghanistan are along zones of high seismic activity. Most of the earthquakes in Pakistan occur in the north and western regions, along the boundary of the Indian tectonic plate with the Iranian and Afghan micro-plates. As mentioned, the more intense seismic activity occurs near regions of thrust faulting which is developing at the Himalayan foothills in both Northern Pakistan and Northern India. In the last hundred years eight earthquakes with magnitude of more than 6 have been recorded in the Uttar Pradesh region of India. These quakes resulted by the gradual shifting of the India tectonic plate beneath the Tibetan plate in the geologically young Himalayan Mountain range and along the Himalayan arc. The Chaman Thrust Fault system is a continuation on land of an extensive transform fault system in the Arabian Sea known as the Owen Fault Zone. The Chaman Fault System is a major fracture which begins in the Balochistan Province. The great Quetta earthquake (M7.7) of 31 May 1935 occurred along the Chaman Fault. The powerful earthquake devastated the town of Quetta and the adjoining region. The Chaman Thrust Fault system extends along Pakistan's frontier with Afghanistan. It begins near Kalat, in the northern Makran range, passes near Quetta and continues in a north-northeastern direction to Kabul, Afghanistan - after branching off to form the Main Karakoram Thrust (MKT) System. The Main Mantle Thrust (MMT) System parallels the Chatham Fault System on the east side of the Pishin Basin. Both the MKT and the MMT turn eastward in the Hazara-Kashmir syntaxial bend near the the Main Boundary Thrust (MBT), the region of major tectonic plate collision. 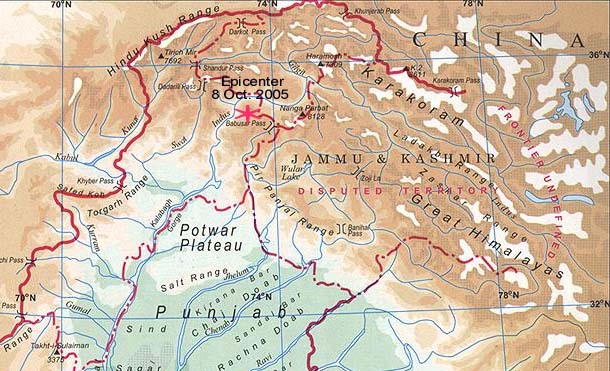 The October 8, 2005 earthquake occurred near this active seismic zone in Northern Pakistan, in the Himalayan foothills. Its focal mechanism and slip and strike components are consistent with the compressive type of thrust faulting which is characteristic for the region and has resulted in folding and the formation of extensive anticlinal ridges in the vicinity of Muzaffarabad - Pakistani Kashmir's main city. Also, other major thrust zones exist along the Kirthar, Sulaiman and Salt mountain ranges of Pakistan. Most earthquakes in Pakistan occur in the north and western sections of the country along the boundary of the Indian tectonic plate with the Iranian and Afghan micro-plates. As indicated, numerous earthquakes occur along the Chaman Fault System. Four major faults exist in and around Karachi and other parts of deltaic Indus, and the southern coast of Makran. The first of these is the Allah Bund Fault. It traverses Shahbundar, Jah, Pakistan Steel Mills, and continues to the eastern parts of Karachi - ending near Cape Monz. Earthquakes along this particular fault have been responsible for considerable destruction in the past. A major earthquake in the 13th century destroyed Bhanbhor. Another major earthquake in 1896, was responsible for extensive damage in Shahbundar. The second major fault near Karachi is an extension of the one that begins near Rann of the Kutch region. The third is the Pubb fault which ends into Arabian sea near the Makran coast. Finally, the fourth major fault near Karachi is located in the lower Dadu district, near Surajani. Many earthquakes have occurred on these faults. Another major fault along the offshore Makran coast (Balochistan and Sindh Provinces), is the result of active subduction zone where major earthquakes have occurred in the past. This zone forms the boundary of the Arabian plate subducting under the Iranian micro-plate. However, the seismicity of the Makran region is relatively low compared to the neighboring regions, which have been devastated regularly by large earthquakes (Jacob and Quittmeyer, 1979). Although infrequent, large earthquakes do occur from time to time along the Makran coast. The great earthquake of 28 November 1945 is an example of the size earthquakes this fault can produce. It generated a destructive tsunami in the Northern Arabian Sea. On 29 March 1999, a destructive earthquake with magnitude of 6.8 struck the Kumaon hills of Uttar Pradesh, 185 miles (295 kilometers) northeast of New Delhi near India's border with China. Another destructive earthquake in 1991, measuring 6.1, killed more than 1,000 people near the town of Uttarkashi in the same region. Most recently, in February 2004, a pair of earthquakes of 5.5 and 5.4 magnitude in Northern Pakistan killed at least 21 people and injured dozens more. Hundreds of homes built of mud, stone and timber were destroyed in a rugged, mountainous area about 90 miles northwest of Islamabad. In January 2001, some 20,000 people died in a magnitude 7.7 quake that was centered in India but also caused damage and deaths in Pakistan. Recent earthquakes in neighboring Iran took a heavy toll on human life. The 2003 earthquake (M6.7) killed 32,000. Another earthquake in 1999 killed 40,000 people in that country. Although not as frequent as in Uttar Pradesh, earthquakes in India's western region of Gujarat - as that of 25 January 2001 - have been more powerful and extremely destructive. 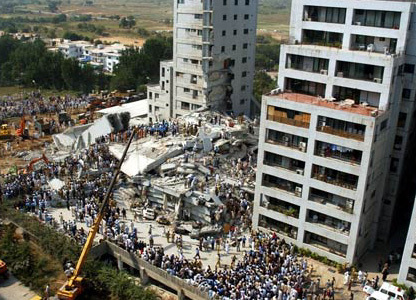 The Gujarat earthquake killed 11,500 in India. The most destructive recent earthquake in the same general area occurred on 20 November 2002 in Northwestern Kashmir. This earthquake had a magnitude 6.4 and its epicenter was 245 km NNE of Islamabad. According to official reports at least 19 people were killed, 40 were injured, and hundreds of buildings were extensively damaged in the Dashkin-Doian-Mushkin area. No earthquake of similar strength as that of October 7, 2005 has occurred in Northern Pakistan or Kashmir in recent years. As reported earlier, the more recent event in the same general area was a 6.4 magnitude earthquake in Northwestern Kashmir on 20 November 2002. It affected the same region and was widely felt in Islamabad a to the Southwest. However, the death toll in northern Pakistan was by far lower. Only 17 people died and 65 more were injured. 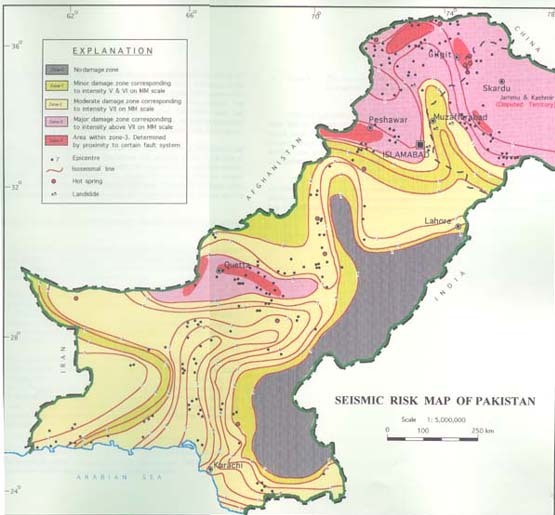 However, the historic record shows that the largest earthquake to strike Pakistan in the 20th Century occurred on 31 May 1935, near Quetta (Balochistan) - a very active seismic region of Pakistan. Up to the 8 October 2005 event this had been the deadliest earthquake in the region. It killed about 35,000 people, although some estimates of up to 50,000 have been provided. The Quetta earthquake, as it was named, had a Moment Magnitude (Mw) of 8.1. Its epicenter was at 27.4 N and 88.75 E.
The city of Quetta which was completely devastated the earthquake (M7.7) of 31 May 1935. About 30,000 people were killed and thousands more were injured. Also, there was extensive destruction and thousands of deaths in Mastung and in all the villages between Quetta and Kalat. A great earthquake (Moment Magnitude Mw 8.0) on 28 November 1945, off Pakistan's Coast of Makran (Balochistan) in the Northern Arabian Sea generated a destructive tsunami in the Northern Arabian Sea. More than 4000 people were killed on the Makran Coast of Pakistan by the earthquake and the tsunami. Also, the tsunami was responsible for great loss of life and destruction along the coasts of Iran, Oman and Western India. Major earthquakes in neighboring Northern India have also caused destruction and deaths in Pakistan. The 1905 Kangra earthquake in India caused extensive destruction in Lahore, Pakistan. A complete listing of other historical earthquakes in Pakistan will be provided in subsequent updates of this report. Aftershocks ­ some of them major - should be expected in the following weeks and even months in the immediate region. Already many aftershocks, one of them as large as 6.2 in magnitude, have struck the area. Another large earthquake is also possible in the same general region as the stress release on a fault may energize other sections of the fault or other faults in Northern Pakistan. Other significant earthquakes in the general South East Asian area may occur in the Uttar Pradesh region of India or elsewhere in Pakistan, Kashmir, or even Afghanistan, as the slippage from the recent shock may have stressed other major thrust faults in the entire region. Preparedness and strict Seismic Building Codes could have mitigated the extent of the damage and could have reduced significantly the death toll - perhaps by as much as 80%. 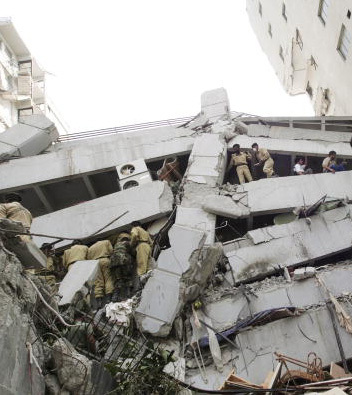 The photographs of collapsed buildings indicate lack of proper building codes. Governments in the region must develop better programs of public preparedness and designate appropriate antiseismic building codes and construction standards to provide safety from the most severe of the earthquakes that historically have affected the region and which will occur again in the future. Ambraseys, N. and Bilham, R., 2003, "Earthquakes and Associated Deformation in North Baluchistan 1892-2001", Bulletin of the Seismological Society of America, Vol .93 ,No. 4, p. 1573 - 1605. Template (modified) Courtesy of "Budget Office & Facility Supply"